Some information on the Tristar: Lockheed introduced the L-1011 after the competition between airplane manufacturers took on a new age: the wide body jet. Plans and contracts for the L-1011 were made long before McDonnel-Douglas introduced the DC-10 but the DC-10 was introduced onto the market earlier because of delays in the Tristar creation. 1970 was the first year with L-1011s in service. The DC-10 is another plane of roughly the same size as the L-1011, but it has more passenger room in the cabin due to the mounting of its tail engine. Over 249 L-1011s were sold and four different models were built (see below). The Tristar can hold 400 seats or 57 tons of cargo. The Tristar was discontinued in 1982 due to demand and the DC-10 became the winner of the competition. There are still many L-1011s in service, however, and its safety record is far superior to that of the DC-10. (I have included a list of accidents in the L1011s history.) American Trans Air purchases their L-1011s from other airlines, which is the explanation of the different color schemes. The -365 and -385 designators were used to identify the respective MGTOW of these aircraft, however, the -385-1 had a MGTOW of 409,000 lbs. The -100 series was designed with 2 extra fuel tanks in the fuselage; 13 were built and 23 -1's were modified to -100's. Other -1's were modified to -50's, -150's and -250's thereby increasing their range. The -50 featured stronger landing gear and tires for a slightly higher weight. The -200 series was designed primarily for hot or high use and increased range of which 24 were made and 14 others converted to -200 status. The -250 (heaviest at 510,000 lbs.) is a hybrid of a -200 (fuselage) and -500 (increased thrust engines) of which Delta was the first operator. The -500 (50 built) was the long-range version of which Delta was also the first U.S. customer. In May of 1972 an L1011 made the first fully automatic U.S. coast-to-coast flight. A total of 250 units were produced. ***(If I am incorrect about any of this info or you know of something else I should add please let me know! 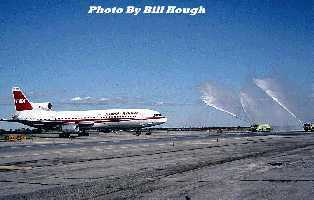 )*** I have created a page dealing with my trip on an ATA L-1011 to Cancun, Mexico. I took video of the trip and have included some snapshots from inside the plane. Below is a Quick Time video of a rocket launch off of a Tristar. This plane is owned by a company called Orbital that sends satellites into orbit using small rockets. The image gallery contains more photos of their L-1011 and the rockets. (Video is Approx. 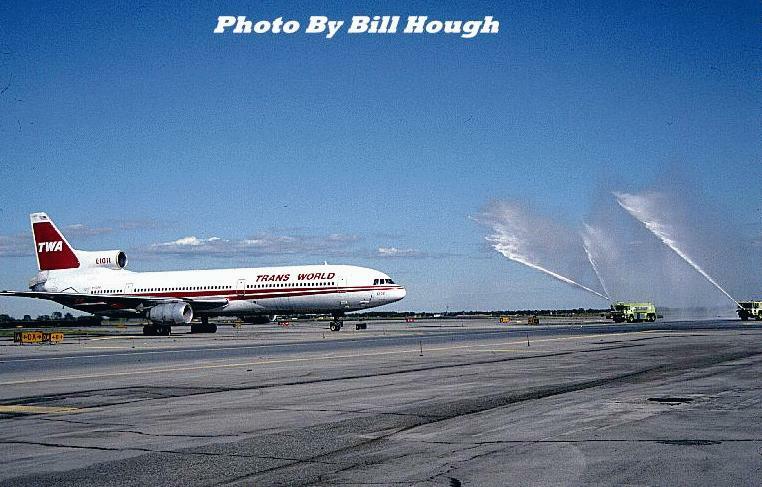 1.9 MB) The retirement of TWA’s L1011s came on September 3, 1997. The final flight was TW840 from LAX to JFK. After landing on Runway 31R at 1604, aircraft N11006 received a water cannon salute from Port Authority fire-fighting vehicles as it turned off taxiway Bravo onto taxiway Delta Alpha. The aircraft parked at Terminal 5 and TWA’s Lockheed era came to an end. Click on the image for a bigger view. Click Here to visit my image gallery of all the images of the Tristar I have collected so far. I have recieved requests for the seating maps in L-1011s so I have put some images on of seating arrangements from different airlines. Click the image for the map. Trans World Arilines The TWA L-1011s were taken out of service Sep. 3, 1997 (see above). United Airlines The L-1011 is not in service with United anymore. Please e-mail me the link of additional airlines with L-1011s, thanks! Variants: standard, 50 high weight (group 1), 150 long range (group 2 & 3). Variants: standard, 250 high weight. Go to: My Personal Page | Photos | Accidents This page was created and looks best in 1024x768 resolution!!! Copyright ©1998 Jacob Wingers Site updated February 26, 1998. The counter only reflects hits on this server.